The bacteria cause inflammation of the gums that is called “gingivitis.” I n gingivitis, the gums become red, swollen and can bleed easily. Gingivitis is a mild form of gum disease that can usually be reversed with daily brushing and flossing, and regular cleaning by a dentist. It does not involve bone loss. 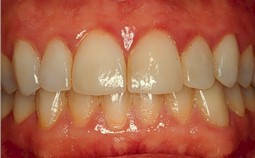 When gingivitis is not treated, it can advance to “periodontitis”. In periodontitis, gums pull away from the teeth and form spaces (called “pockets”) that become infected. 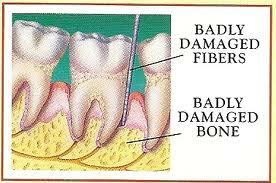 The body’s immune system fights the bacteria as the plaque spreads and grows below the gum line. Bacterial toxins and the body’s natural response to infection start to break down the bone and connective tissue that hold teeth in place. If not treated, the bones, gums, and tissue th at support the teeth are destroyed. The teeth may eventually become loose and have to be removed. Due to chronic infection of the gums, our body produces high levels of C-reactive protein (CRP) which increases risks for heart attack, stroke and other systemic diseases. Periodontitis may also causes erectile dysfunction and impotence in man. Women are more susceptible to gum disease due to hormonal fluctuations. Periodontitis during pregnancy may also harm your baby. Once treated, these harmful effects can decrease or disappear. Regular dental visits and due diligence with daily brushing and flossing are the most important steps in gum disease prevention. If gum disease is diagnosed, prompt treatment is imperative for better teeth and better health. Treating gum disease can improve your general health, your social life, and even your longevity. Gum recession can be caused by as simple as overzealous brushing. It can also be caused by abnormal biting force (night bruxism, crooked teeth, etc), aging, eating disorders, dipping tobacco, gum disease or adult braces treatment. When gums recede, tooth appears longer and shows black triangles. Also affected tooth may be sensitive to cold or even touch. Untreated gum recession deteriorates over time, and exposed roots may suffer decay. Eventually it may cause tooth loss. How to Treat Gum Recessions? Traditional treatment includes bonding/veneers and gum graft. Bonding or veneers may help reduce sensitivity or temporarily improve appearance, but condition worsens oven time. Gum grafting involves cutting gums from roof of mouth and grafted over receded area. It may be expensive and painful experience. In the past few years Alloderm microsurgery becomes available, and treatment becomes less invasive. Expense and recovery time, however, still impose challenges to most patients. Thanks to Dr John Chao in California, a minimally invasive microsurgical technique called Pinhole Surgical Gum Rejuvenation or PST offers less expensive and same day recovering alternative to gum grafting. Please see Dr Steve Show interviewing Dr Chao on PST.